Oil giveth, and oil taketh away (from Kuwait, Saudi Arabia, Iraq, Venezuela, Russia… and even from the American oil patch). There is certainly a positive economic side to much lower oil prices, especially for countries that import nearly all their oil and gas. Germany and Japan come to mind, but there are many others. For them, lower oil prices act like a large nationwide tax cut, not just for consumers but also for businesses. And it impacts natural gas. Natural gas in the international markets is often priced based on oil prices, something that natural gas importers – whether the EU, Japan, Korea, or China – have fought for years as oil prices kept rising. While their natural gas costs went up with oil, natural gas prices in the US fell, which has given US-based industries a big cost advantage. But that talk of delinking natural gas prices from plunging oil prices has suddenly stopped, mysteriously. In those countries, energy-dependent industrial producers are going to breathe a big sigh of relief. Refiners and the entire distribution network pocket fatter margins, and they’re smiling all the way to the bank. Consumers are smiling too. In these countries, everyone is happy with a lower price of oil. In countries that also produce oil and gas, such as the US, it’s a mixed bag. There are many beneficiaries. But the oil price plunge threatens to decimate a crucial, nearly miraculous growth industry, where jobs are plentiful and well-paid, where capital expenditures are enormous, and where secondary industries have sprung up to serve the boom: steel-pipe makers, tank-car makers, railroads, frack-sand producers…. And there the bloodletting has already started. 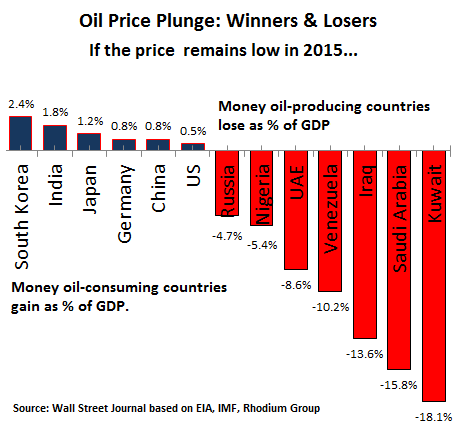 Then there are countries where oil is the dominant industry, and there are no winners among them. I wonder where Norway, whose economy depends on oil, fits on this list. Did it fall off the bottom? New oil projects are getting scrapped amid falling production and plunging prices [Norway May Need to Build a Post-Oil Economy Pronto]. In the same breath, we may have to make room on this list for our own petro-states, such as North Dakota. I’ve lived through an oil bust in Texas and Oklahoma, ran a business during it, watched how banks collapsed, how commercial and residential real estate plummeted, how formerly booming, expensive restaurants ran out of customers and shut down, how oil companies moved their headquarters from Tulsa to Houston, how all construction came to a halt, how one famous futuristic high-rise was capped at the eighth floor, leaving it as an ominous granite-clad oval stump, how Tulsa lost about 15% of its jobs over the years that followed, how young educated adults fled because there was nothing to do for them…. It was a tough time. A similar thing happened in Oklahoma City. In Dallas, real estate crashed and banks collapsed as well, but the Texas economy was much larger and much more diversified, and the oil companies that left Tulsa ended up in Houston. So the results weren’t quite as dramatic, and the Texas economy recovered fairly quickly. Oil busts, after these heady booms, especially in non-diversified local economies, can exact a terrible price even in the US oil patch.